Longtime observers of American politics have noted striking parallels between the unpredictable wartime election of 1968 and the bizarre presidential contest of 2016, another time of war and distress, as Michael Winship recalls. Watching the mad, mad, mad, mad world that is the 2016 presidential campaign, I was trying to remember a presidential campaign that was as jaw-dropping, at least in my lifetime, and easily settled on 1968. For those too young to remember, imagine: As fighting in Vietnam rages on and the Tet Offensive makes us all too aware of the futility of our Southeast Asian military fiasco, Minnesota Sen. Eugene McCarthy decides to run as an antiwar candidate against incumbent President Lyndon Johnson. Supported by an army of “Clean for Gene” college students knocking on doors and making phone calls, McCarthy does surprisingly well, and then New York Sen. Robert Kennedy gets into the race, too. Johnson makes a surprise announcement that he will not seek a second term in the White House and McCarthy and Kennedy duke it out in the primaries. In the midst of all this, civil rights giant Martin Luther King Jr., is assassinated in Memphis, Tennessee, and riots erupt across the cities of the United States. Two months later, Kennedy is murdered in the kitchen of a Los Angeles hotel just minutes after winning the California primary. In August, eight years after his defeat by John F. Kennedy, the Republicans bring back Richard Nixon as their presidential candidate and the Democrats select Vice President Hubert Humphrey, who has not run in a single primary, as their party’s standard bearer. Simultaneously, a police riot against protesters outside the Democratic convention in Chicago leaves an indelible image of chaos, tear gas and blood. Nixon wins the election with a well-executed campaign set to the accompaniment of dog whistle signals against minorities and left-wing dissenters. Oh, and one other thing — Alabama Gov. George Wallace, arch segregationist and race baiter, runs as the third-party candidate of the American Independent Party, campaigning as a rebel populist seeking the votes of the angry, white working class. He wins almost 10 million votes and carries five states in the South. All of which brings me to one of the curiosities of that manic ‘68 campaign season, a slim volume written by Russell Baker, former New York Times columnist and veteran White House and congressional reporter. First serialized in The Saturday Evening Post, it was published as a book under the title Our Next President: The Incredible Story of What Happened in the 1968 Elections. But here’s the thing: Baker’s book was written before all the events I just described. It was imaginary, a work of speculative fiction that soon found the real thing giving it a run for its money. And yet, much of what Baker dreamed up presaged what really happened and is eerily reminiscent of what’s going on in 2016 America. In the book, President Johnson is indeed as besieged as the actual LBJ – “being ground in a politics of frustration more bitter than any could remember since the Depression election of 1932,” Baker writes. “A seemingly endless war, record food prices, rising taxes, intractable poverty, a surly unmanageable Congress and now an incipient revolution of race – and Johnson bore the burden of public blame for all.” It’s all too similar to the climate today. But in Baker’s version of history, Johnson uses his legendary political wiles to create a scenario that he believes will lead to his reelection – Hubert Humphrey is made to step down as vice president, becoming secretary of state, and Kennedy is named as the next vice president, creating a Johnson-Kennedy ticket. Pandemonium ensues. As in the actual summer of 1968, there are race riots that impact the campaign and as is the case in 2016, the Republican Party is in complete disarray, riven by a plethora of potential candidates, many of whose names may now seem unfamiliar but all of whom were genuine presidential possibilities – Mitt Romney’s father, George, the governor of Michigan; Ohio Gov. James Rhodes; former Pennsylvania Gov. William Scranton and Illinois Sen. Charles Percy, among others. There’s Nixon, of course, New York’s Gov. Nelson Rockefeller and, oh yes, California Gov. Ronald Reagan. After much shouting and disruption, eventually they choose as their slate New York City Mayor John Lindsay and running mate John Tower, conservative U.S. senator from Texas. If, as Mark Twain supposedly said, history does not repeat itself but certainly does rhyme, Russell Baker’s description of the state of the union nearly 50 years ago and a Wallace candidacy that’s so very much like Donald Trump’s is as blank verse from the past, reflecting a national mood that today is perhaps even more confused and enraged. An aversion to spoilers tempts me to not tell you how Baker’s story ends but you may have trouble tracking down a copy of this long out-of-print little book, so here it is: the three-way election – Johnson vs. Lindsay vs. Wallace – is deadlocked in the Electoral College. As per the Constitution, the choice of president is turned over to the House of Representatives, and the Senate chooses the vice president. A series of maneuvers, miscalculations and skullduggery ultimately results in a second President Kennedy. From the Archive: The 1968 election had one shocking turn after another, but its final and arguably worst twist – still largely unknown to Americans – traded untold death in Vietnam for political power in Washington, Robert Parry wrote in 2012. 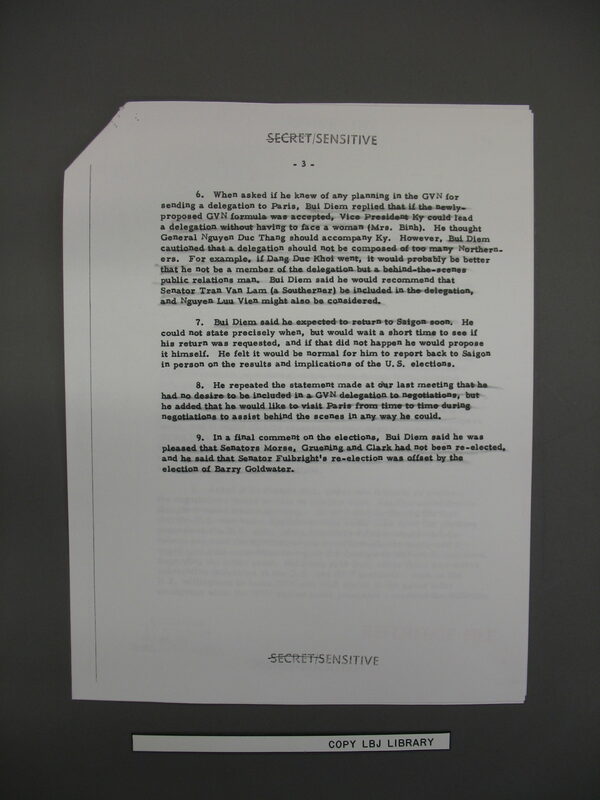 On May 14, 1973, Walt W. Rostow, who had been national security adviser during some of the darkest days of the Vietnam War, typed a three-page “memorandum for the record” summarizing a secret file that his former boss, President Lyndon Johnson, had amassed on what may have been Richard Nixon’s dirtiest trick, the sabotaging of Vietnam peace talks to win the 1968 election. Rostow reflected, too, on what effect LBJ’s public silence may have had on the then-unfolding Watergate scandal. 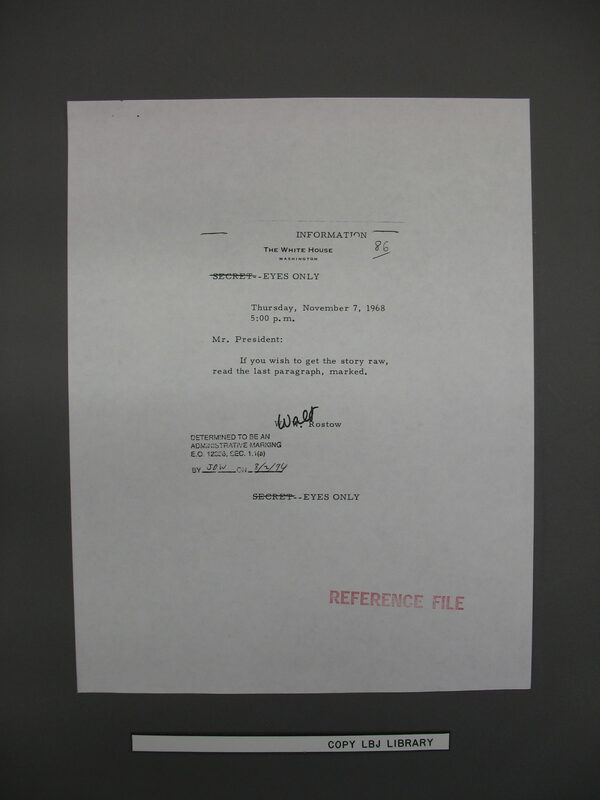 As Rostow composed his memo in spring 1973, President Nixon’s Watergate cover-up was unraveling. Just two weeks earlier, Nixon had fired White House counsel John Dean and accepted the resignations of two top aides, H.R. Haldeman and John Ehrlichman. 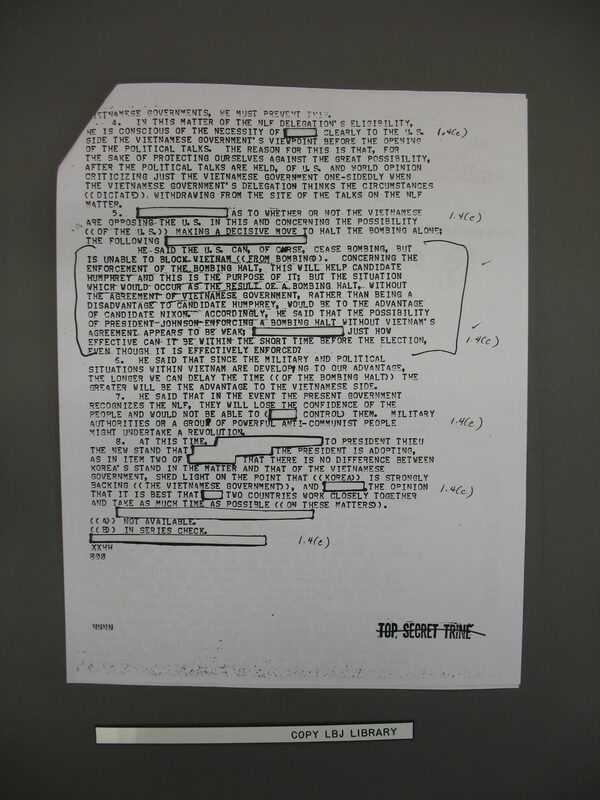 Three days after Rostow wrote the memo, the Senate Watergate hearings opened as the U.S. government lurched toward a constitutional crisis. 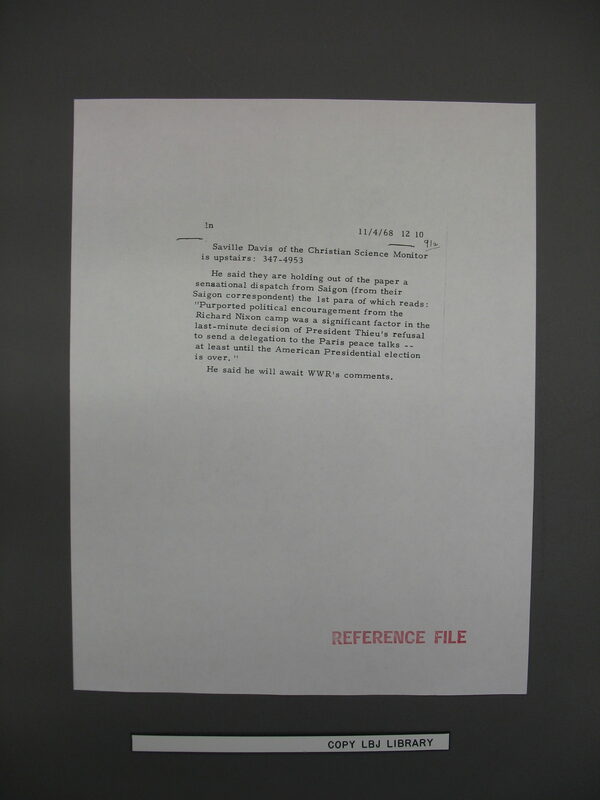 Yet, as he typed, Rostow had a unique perspective on the worsening scandal. He understood the subterranean background to Nixon’s political espionage operations. 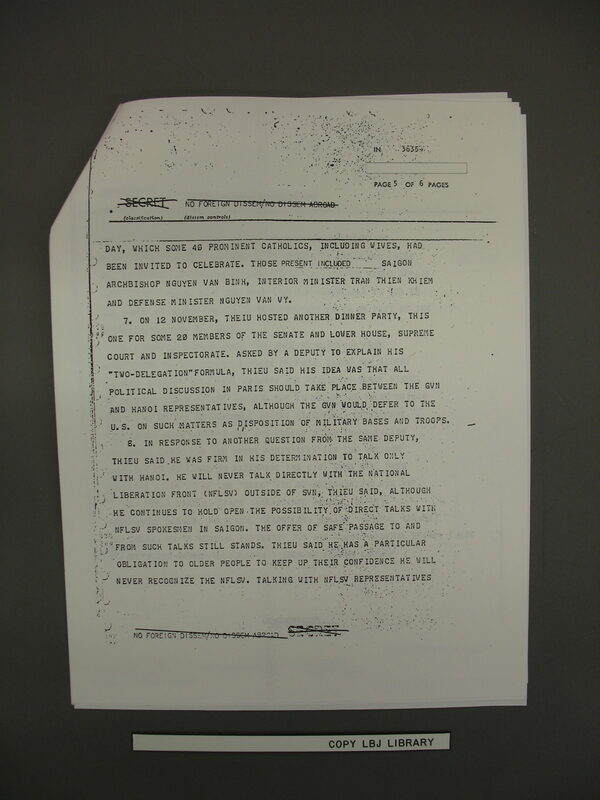 “I am inclined to believe the Republican operation in 1968 relates in two ways to the Watergate affair of 1972,” Rostow wrote. He noted, first, that Nixon’s operatives may have judged that their “enterprise with the South Vietnamese” in frustrating Johnson’s last-ditch peace initiative had secured Nixon his narrow margin of victory over Democratic Vice President Hubert Humphrey in 1968. 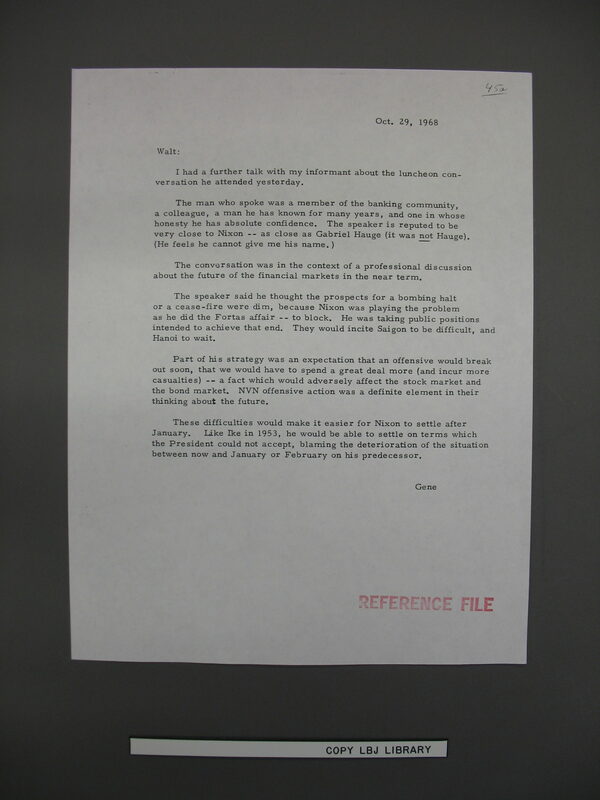 Rostow also was aware that as the Watergate scandal deepened in late 1972 and early 1973 Nixon’s men had curiously approached the retired President Johnson with veiled threats about going public with their knowledge that Johnson had ordered wiretaps to spy on their Vietnam peace sabotage in 1968. Apparently, Nixon thought he could bully Johnson into helping shut down the Watergate probe. Instead, the threat had infuriated Johnson, who was still pained by his failure to end the Vietnam War before he left office on Jan. 20, 1969, a tragic lost opportunity that he blamed on Nixon’s treachery and deceit. Just a couple of weeks after Nixon’s strange overture about the 1968 bugging and two days after Nixon was sworn in for a second term, Johnson died of a heart attack on Jan. 22, 1973. Rostow apparently struggled with this question for the next month as the Watergate scandal continued to expand. 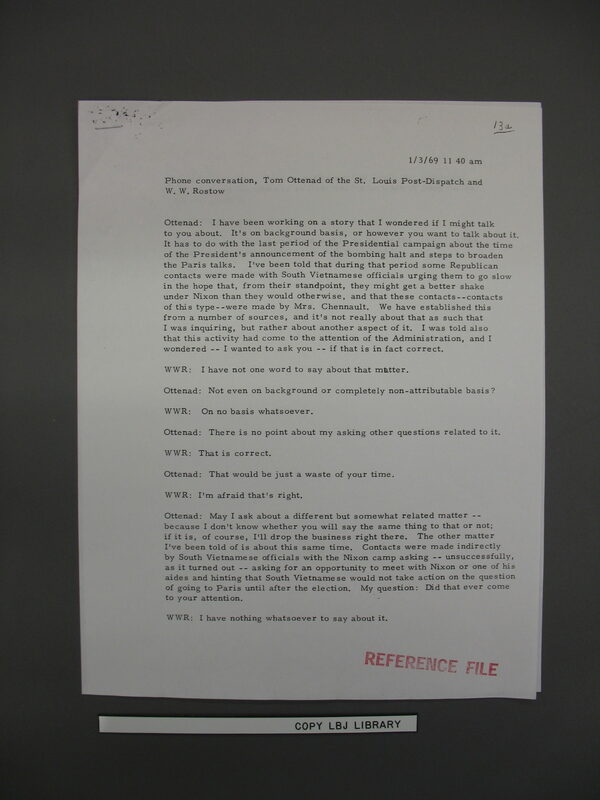 On June 25, 1973, John Dean delivered his blockbuster Senate testimony, claiming that Nixon got involved in the cover-up within days of the June 1972 burglary at the Democratic National Committee. Dean also asserted that Watergate was just part of a years-long program of political espionage directed by Nixon’s White House. In other words, Rostow intended this missing link of American history to stay missing for another half century. 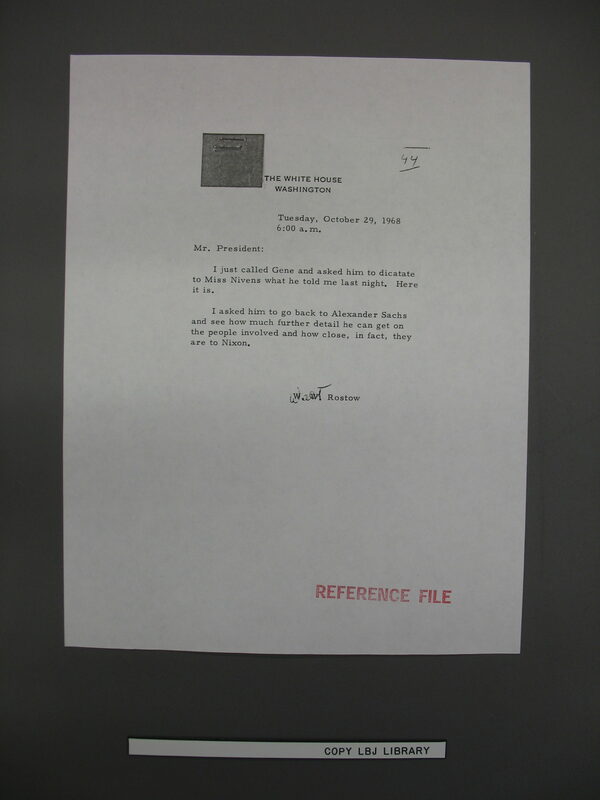 In a typed cover letter to LBJ Library director Harry Middleton, Rostow wrote: “Sealed in the attached envelope is a file President Johnson asked me to hold personally because of its sensitive nature. 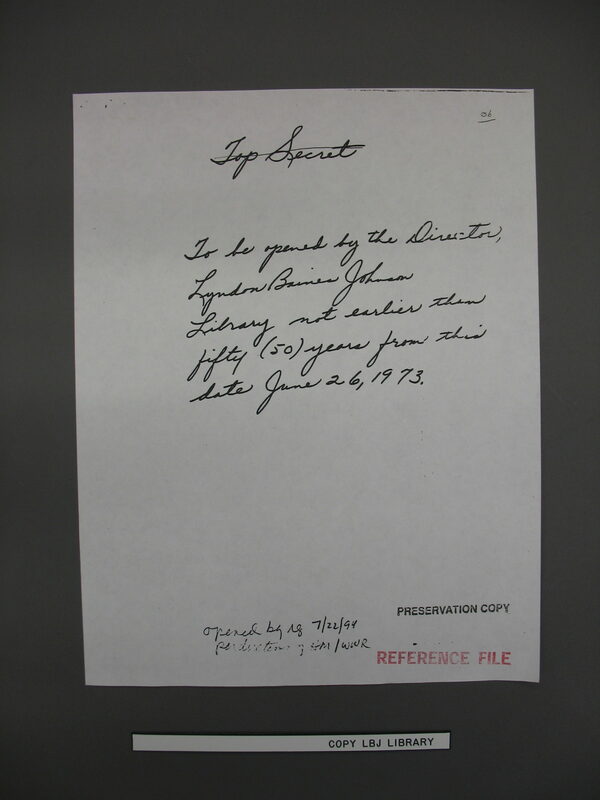 In case of his death, the material was to be consigned to the LBJ Library under conditions I judged to be appropriate. 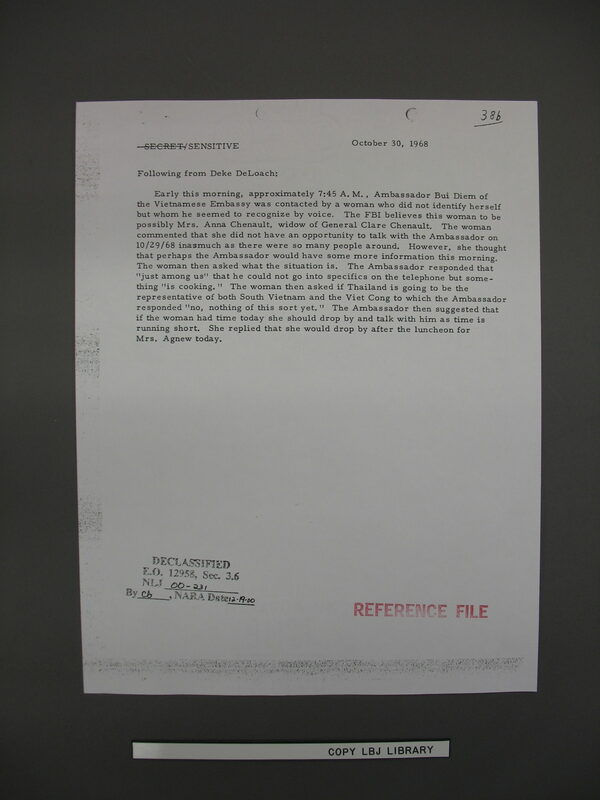 “The file concerns the activities of Mrs. [Anna] Chennault and others before and immediately after the election of 1968. 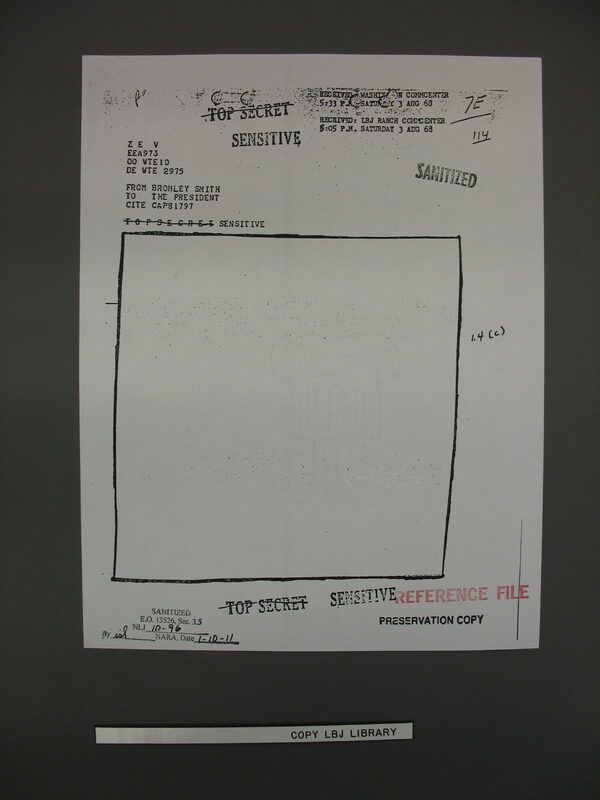 At the time President Johnson decided to handle the matter strictly as a question of national security; and in retrospect, he felt that decision was correct. 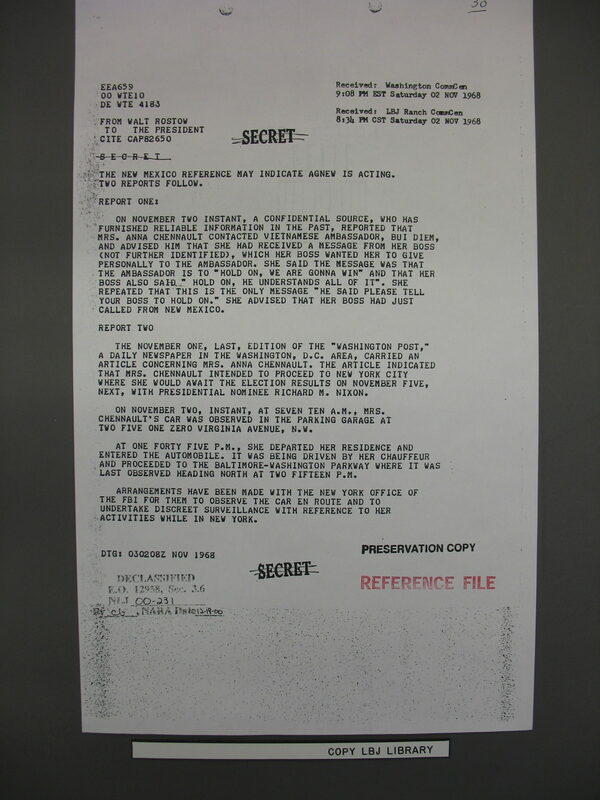 Still, the dozens of declassified documents revealed a dramatic story of hardball politics played at the highest levels of government and with the highest of stakes, not only the outcome of the pivotal 1968 presidential election but the fate of a half million U.S. soldiers then sitting in the Vietnam war zone. 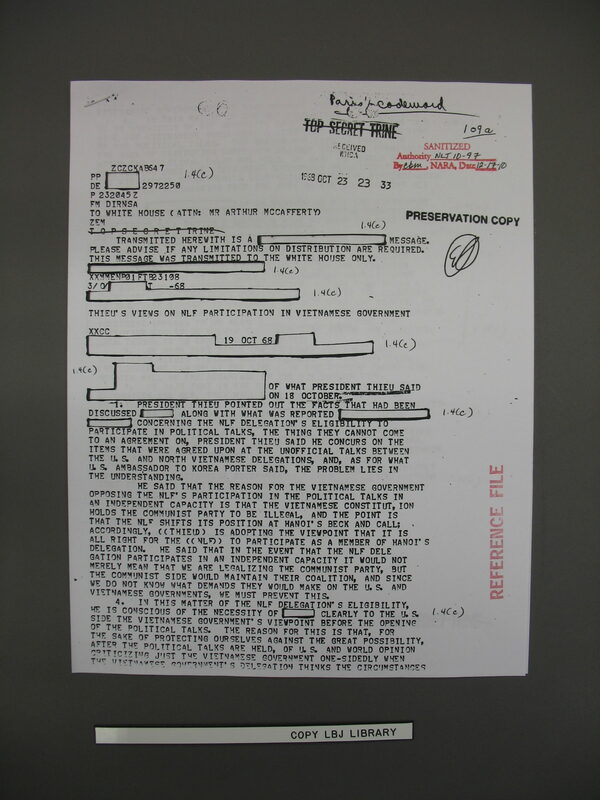 Relying on national security wiretaps of the South Vietnamese Embassy in Washington and surveillance of right-wing China Lobby activist Anna Chennault, Johnson concluded that Nixon’s Republican presidential campaign was colluding with South Vietnamese President Nguyen van Thieu to derail the Paris peace talks and thus deny a last-minute boost to Democratic presidential nominee, Vice President Hubert Humphrey. At the time, Johnson thought a breakthrough was near, one that could have ended a war which had already claimed the lives of more than 30,000 American troops and countless Vietnamese. 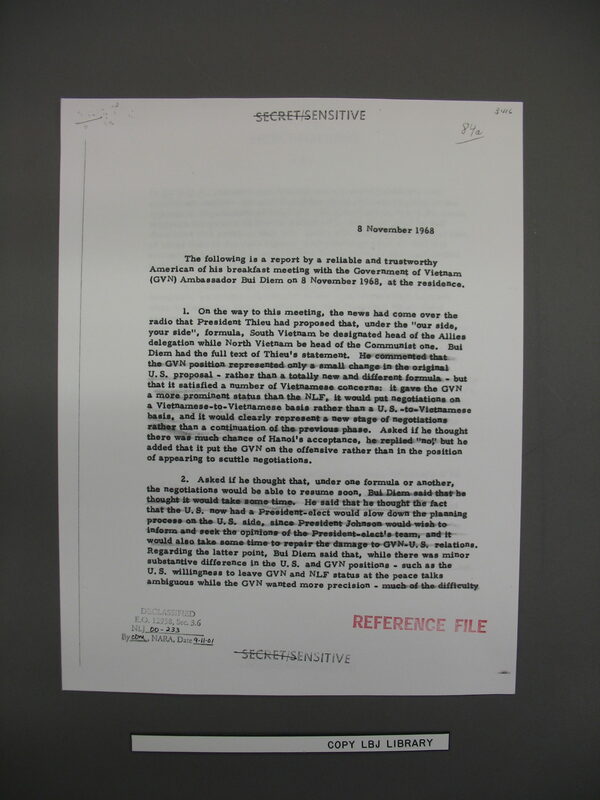 Nixon, like Humphrey, was receiving briefings on the progress as the negotiations gained momentum in October 1968. The Johnson administration was encouraged when North Vietnam agreed on a framework for peace talks. 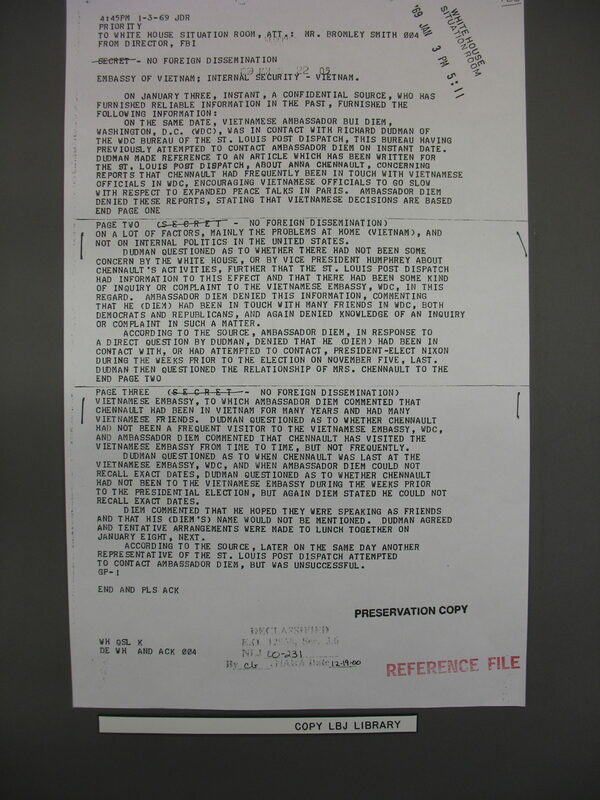 However, America’s South Vietnamese allies began to balk over details about how the negotiations would be conducted, objecting to any equal status for the South Vietnamese Viet Cong insurgents. 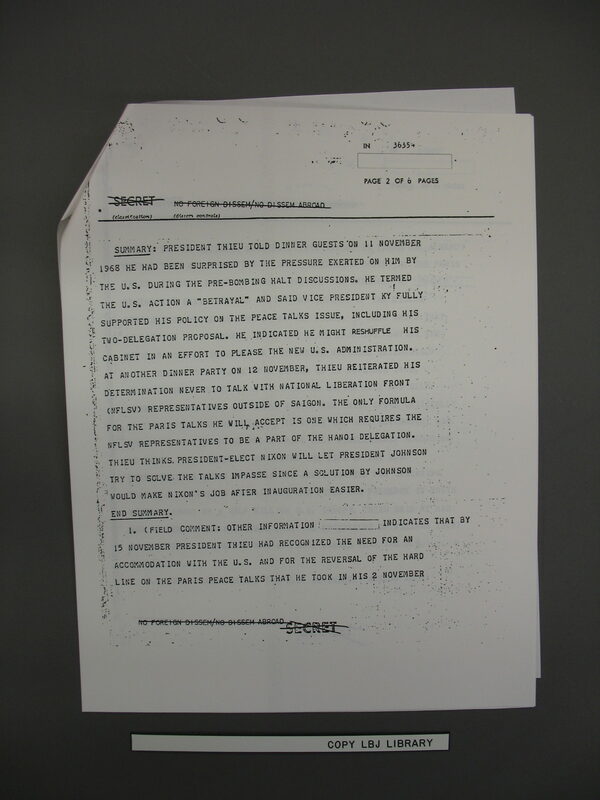 “Top Secret” reports from the National Security Agency informed President Johnson that South Vietnam’s President Thieu was closely monitoring the political developments in the United States with an eye toward helping Nixon win the Nov. 5 election. 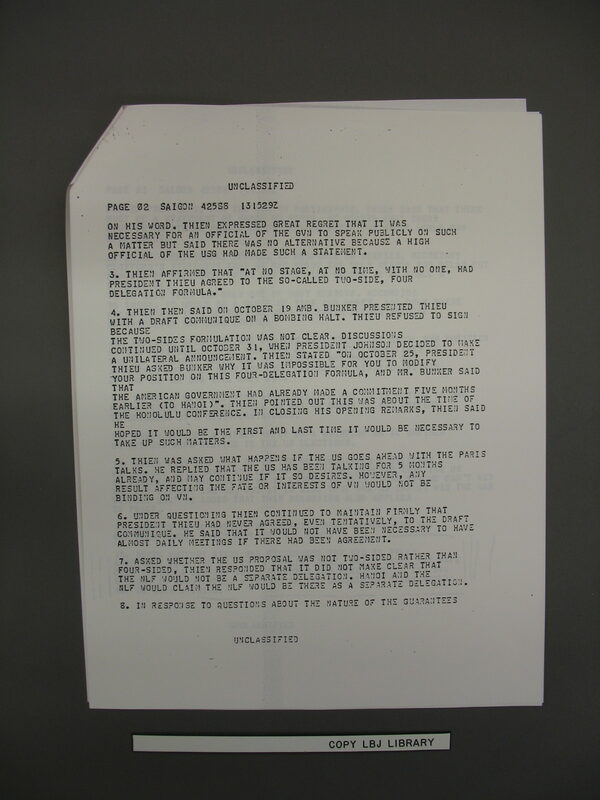 For instance, an Oct. 23, 1968, report presumably based on NSA’s electronic eavesdropping quotes Thieu as saying that the Johnson administration might halt the U.S. bombing of North Vietnam as part of a peace maneuver that would help Humphrey’s campaign but that South Vietnam might not go along. 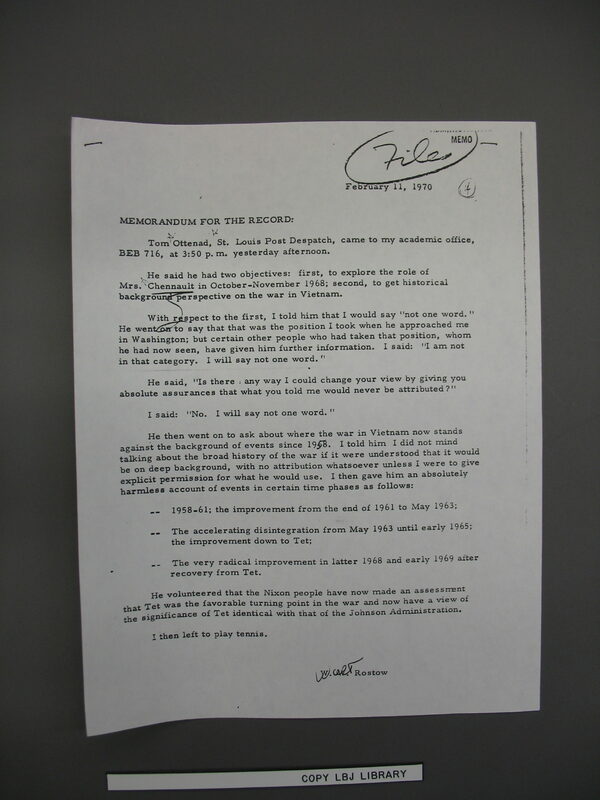 Thieu also appreciated the other side of the coin, that Johnson’s failure would help Nixon. 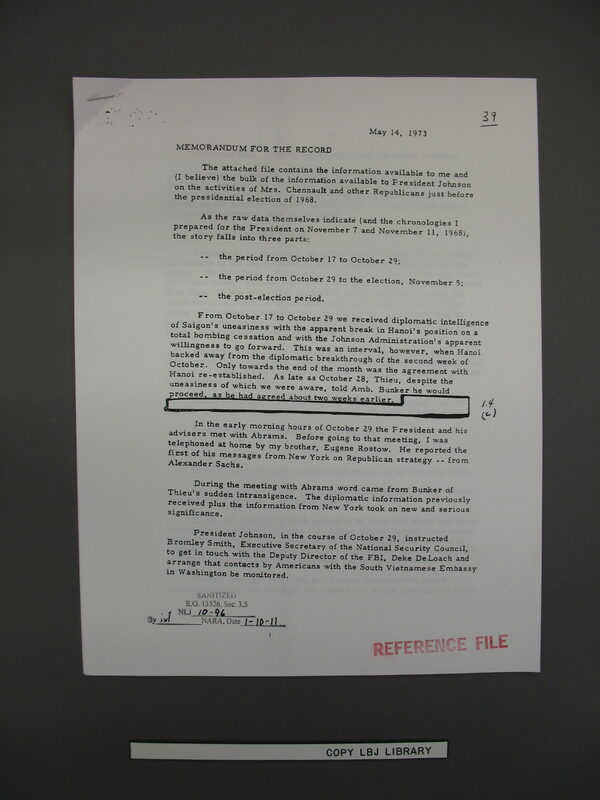 By Oct. 28, 1968, according to another NSA report, Thieu said “it appears that Mr. Nixon will be elected as the next president” and that any settlement with the Viet Cong should be put off until “the new president” was in place. 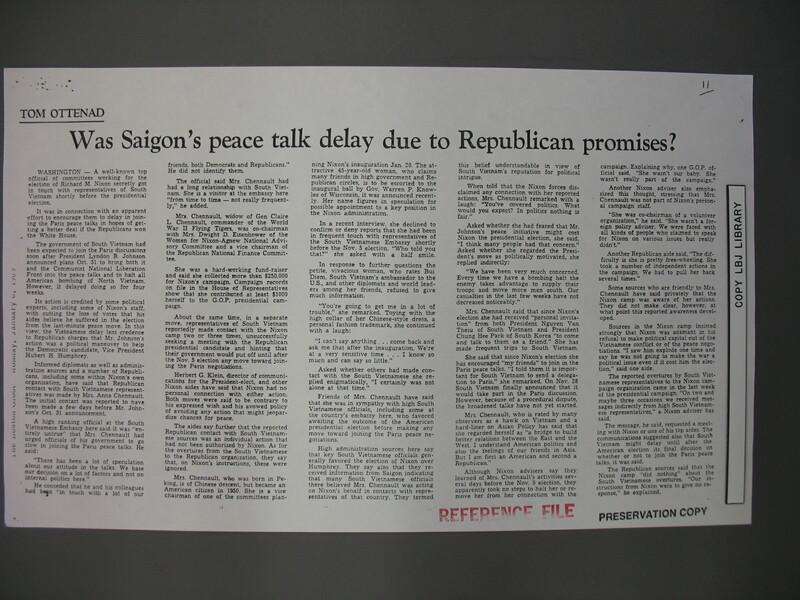 A separate memo from Eugene Rostow said the speaker had added that Nixon “was trying to frustrate the President, by inciting Saigon to step up its demands, and by letting Hanoi know that when he [Nixon] took office ‘he could accept anything and blame it on his predecessor.’” So, according to the source, Nixon was trying to convince both the South and North Vietnamese that they would get a better deal if they stalled Johnson. The White House soon learned that Anna Chennault, the fiercely anticommunist Chinese-born widow of Lt. Gen. Claire Chennault and a member of Nixon’s campaign team, was holding curious meetings with South Vietnamese Ambassador to the United States Bui Diem. On Oct. 30, an FBI intercept overheard Bui Diem telling Mrs. Chennault that something “is cooking” and asking her to come by the embassy. On Oct. 31, at 4:09 p.m., Johnson his voice thick from a cold began working the phones, trying to counteract Nixon’s chicanery. The Democratic president called Republican Senate Leader Everett Dirksen and broached a concern about Nixon’s interference with the peace talks. Johnson said he considered Nixon’s behavior a betrayal because he had kept Nixon abreast of the peace progress, according to an audio recording of the conversation released by the LBJ Library in late 2008. Dirksen responded by expressing the Republican concern that Johnson might spring a breakthrough on the peace talks right before the election. “The fellas on our side get antsy-pantsy about it,” the Illinois Republican said. “They wonder what the impact would be if a cease-fire or a halt to the bombing will be proclaimed at any given hour, what its impact would be on the results next Tuesday,” Election Day. That night, Johnson announced a bombing halt of North Vietnam, a key step toward advancing the peace process. The next morning at 11:38, he discussed the state of play with Sen. Richard Russell, D-Georgia, chairman of the Senate Armed Services Committee. Johnson again mentioned Nixon’s secret maneuverings though expressing hope that his warning to Dirksen had worked. However, on Nov. 2, Johnson learned that his protests had not shut down the operation. 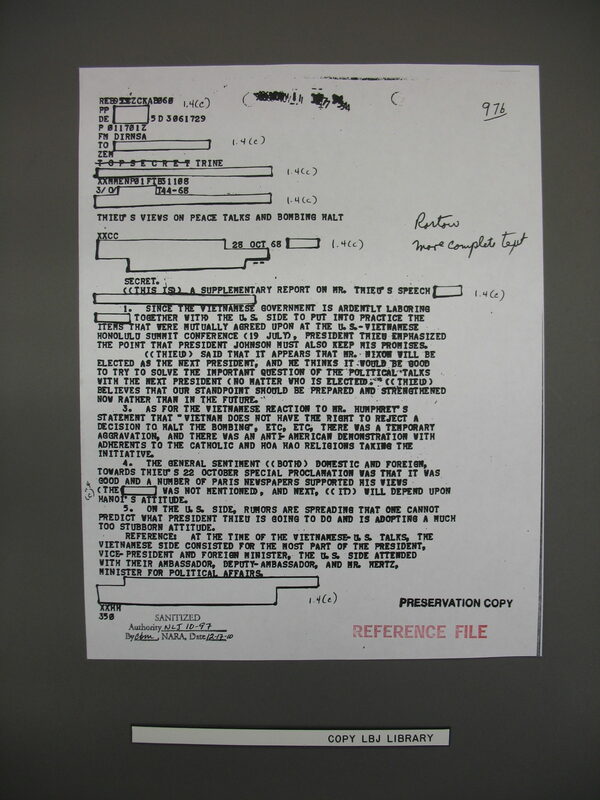 The FBI intercepted the most incriminating evidence yet of Nixon’s interference when Anna Chennault contacted Ambassador Bui Diem to convey “a message from her boss (not further identified),” according to an FBI cable. That same day, Thieu recanted on his tentative agreement to meet with the Viet Cong in Paris, pushing the incipient peace talks toward failure. That night, at 9:18, an angry Johnson from his ranch in Texas telephoned Dirksen again, to provide more details about Nixon’s activities and to urge Dirksen to intervene more forcefully. Nixon also insisted that he would do whatever President Johnson and Secretary of State Dean Rusk wanted, including going to Paris himself if that would help. “I’m not trying to interfere with your conduct of it; I’ll only do what you and Rusk want me to do,” Nixon said, recognizing how tantalizingly close Johnson was to a peace deal. According to some reports, Nixon himself was gleeful after the conversation ended, believing he had tamped down Johnson’s suspicions. However, privately, Johnson didn’t believe Nixon’s protestations of innocence. However, on Nov. 4, the White House received another report from the FBI that Anna Chennault had visited the South Vietnamese embassy. Johnson also got word that the Christian Science Monitor was onto the story of Nixon undermining the peace talks. 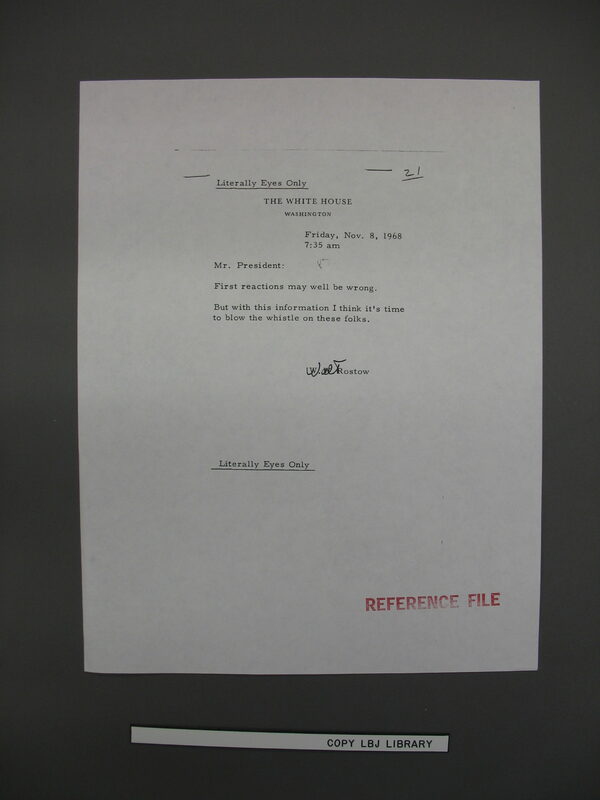 The Monitor’s inquiry gave President Johnson one more opportunity to bring to light the Nixon campaign’s gambit before Election Day, albeit only on the day before and possibly not until the morning of the election when the Monitor could publish the story. So, Johnson consulted with Rusk, Rostow and Defense Secretary Clark Clifford in a Nov. 4 conference call. Those three pillars of the Washington Establishment were unanimous in advising Johnson against going public, mostly out of fear that the scandalous information might reflect badly on the U.S. government. 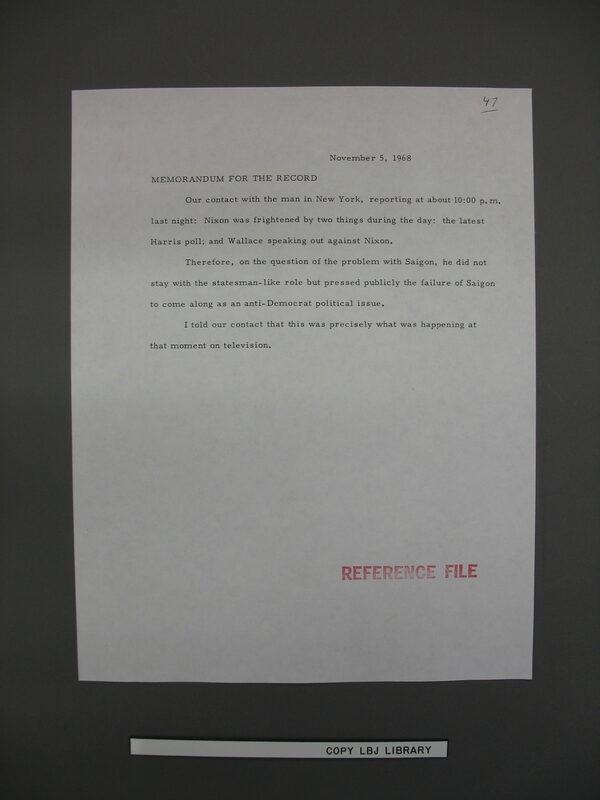 According to a “memorandum for the record,” presumably written by Walt Rostow, “our contact with the man in New York” reported on Election Day, Nov. 5, that Nixon remained nervous about the election’s outcome and thus reneged on his commitment to Johnson not to exploit the peace-talk stalemate for political gain. 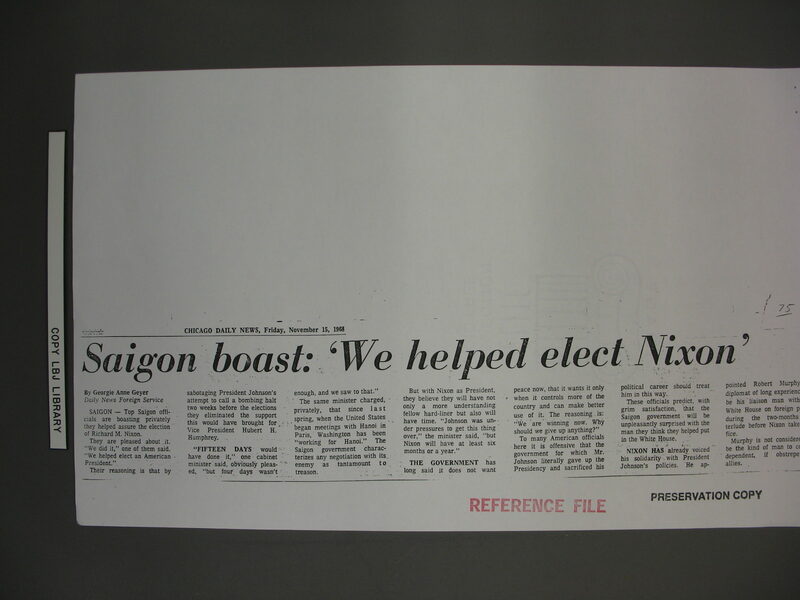 “On the question of the problem with Saigon, he [Nixon] did not stay with the statesman-like role but pressed publicly the failure of Saigon to come along as an anti-Democrat political issue,” the memo said. So, even as Johnson refused to exploit evidence of Nixon’s “treason,” Nixon played hardball until the last vote was cast. Nixon narrowly prevailed over Humphrey by about 500,000 votes or less than one percent of the ballots cast. 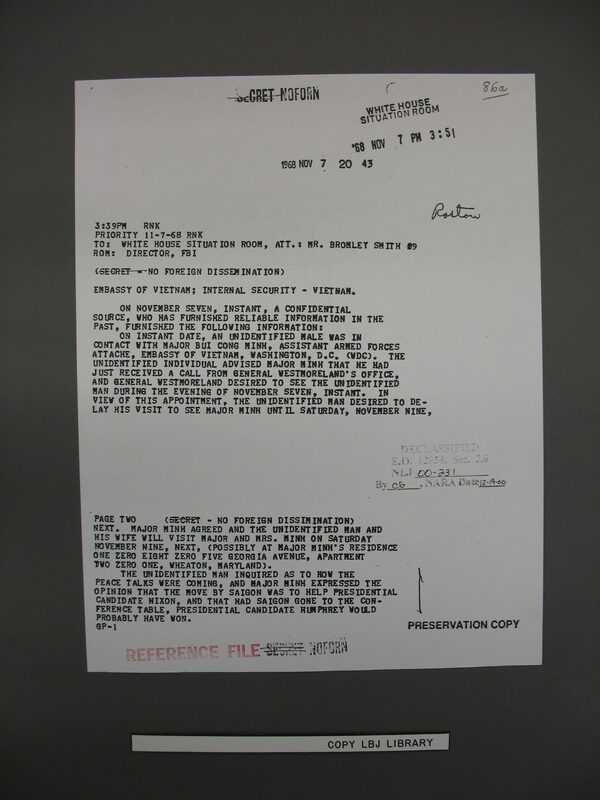 On the day after the election, Rostow relayed to Johnson another FBI intercept which had recorded South Vietnamese Ambassador Bui Diem saying, prior to the American balloting, that he was “keeping his fingers crossed” in hopes of a Nixon victory. The White House also learned that Anna Chennault remained in contact with Ambassador Bui Diem, including a cryptic conversation on Nov. 7, in which she told him she had conveyed a message from President Thieu to “them,” presumably a reference to the Nixon team. 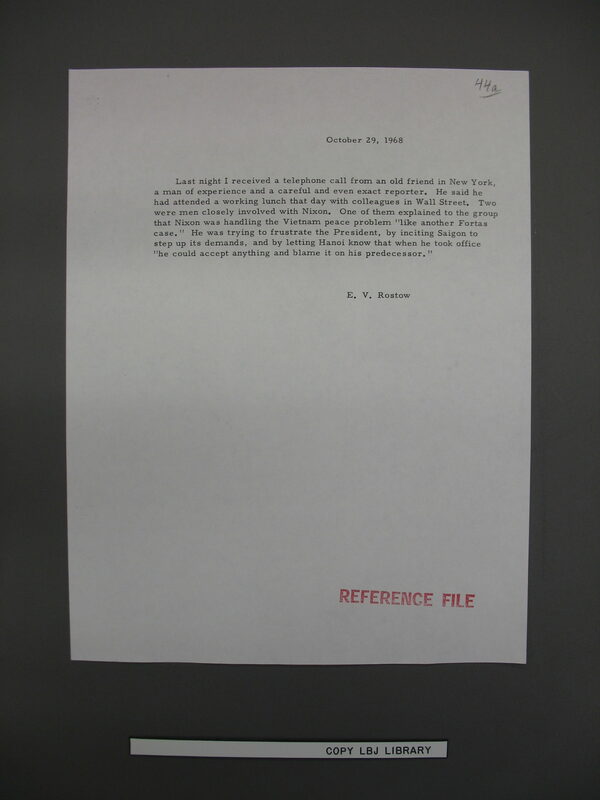 After reading the cable on the morning of Nov. 8, Rostow wrote to Johnson, “First reactions may well be wrong. But with this information I think it’s time to blow the whistle on these folks.” Of course, as the president-elect, Nixon was now in the driver’s seat and there wasn’t anything Johnson could do to change that. Another report on Nov. 8 described a breakfast meeting between Ambassador Bui Diem and “a reliable and trustworthy American,” who discussed President Thieu’s revised approach to the Paris talks which “gave the GVN [South Vietnam] a more prominent status than the NLF [Viet Cong] and put negotiations on a Vietnamese-to-Vietnamese basis rather than a U.S.-to-Vietnamese basis. 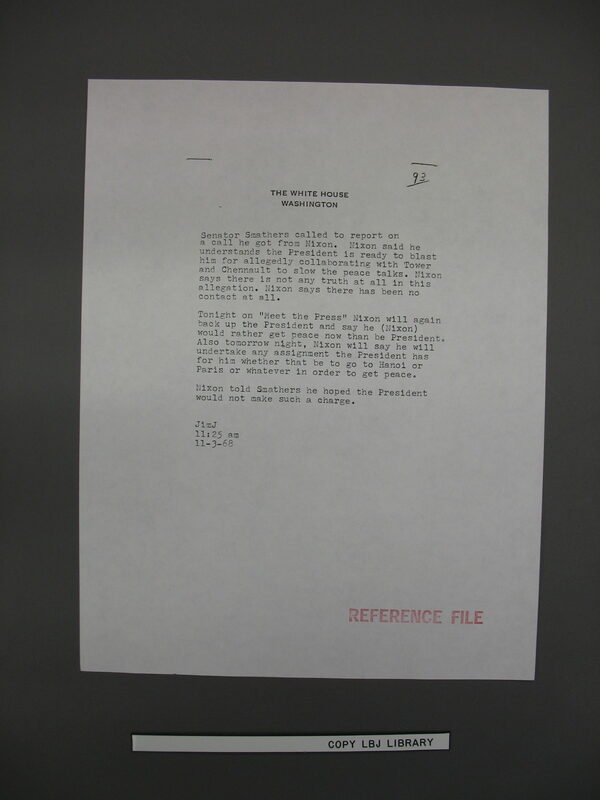 The report upset Johnson, but he chose to continue trying to persuade Nixon to live up to his pre-election commitment to do whatever he could to push the peace process toward success. 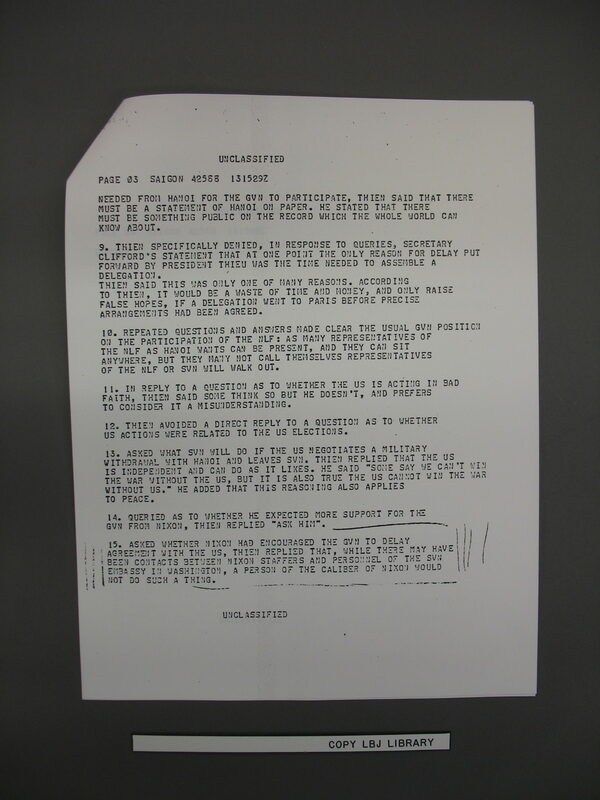 At 2:54 p.m. on Nov. 8, Johnson spoke again with Sen. Dirksen to stress the urgency of Nixon getting Thieu to reverse his position on the peace talks. “Hell, no, this ought to go right now,” Johnson declared. “If they [the South Vietnamese] don’t go in there this week, we’re just going to have all kinds of problems. We want Thieu to get a message so he can get a delegation from Saigon to Paris next week. We think we’ve held up each day, we’re killing men. We’re killing men. That evening at 9:23, Nixon called Johnson from Key Biscayne, Florida, where Nixon was taking a vacation after the grueling election. 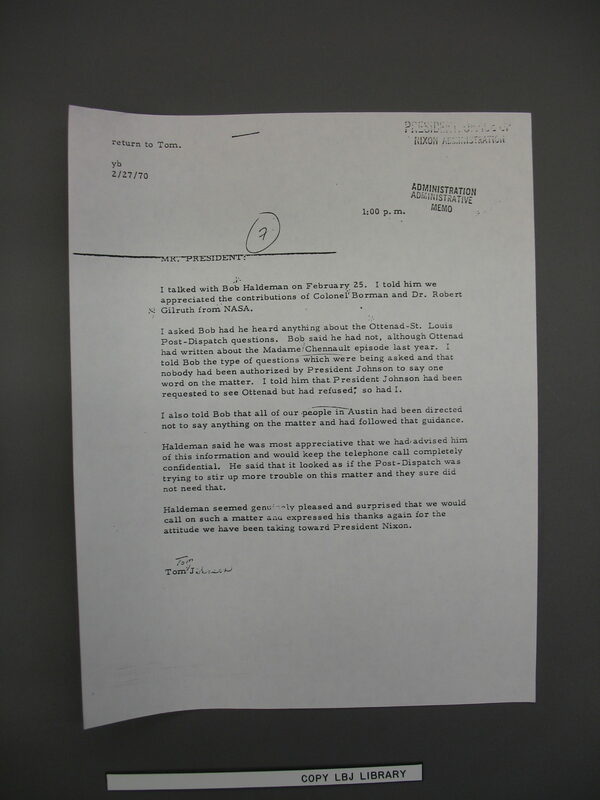 Nixon sounded confident and relaxed, even as Johnson continued to push regarding the peace talks. Johnson recounted the evidence of the continued interference by Nixon’s emissaries and even described the Republican motivation for disrupting the talks, speaking of himself in the third person. “Johnson was going to have a bombing pause to try to elect Humphrey; they [the South Vietnamese] ought to hold out because Nixon will not sell you out like the Democrats sold out China,” Johnson said. 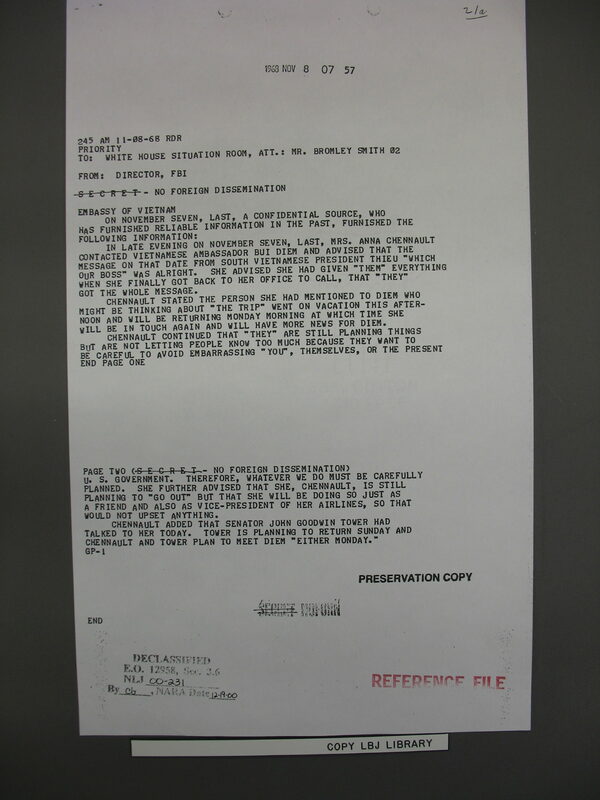 Faced with Johnson’s threat, Nixon promised to tell the South Vietnamese officials to reverse themselves and join the peace talks. However, nothing changed. On Nov. 13, South Vietnam’s Minister of Information Ton That Thein held a press conference criticizing Johnson and his diplomats for rushing matters on the peace talks. 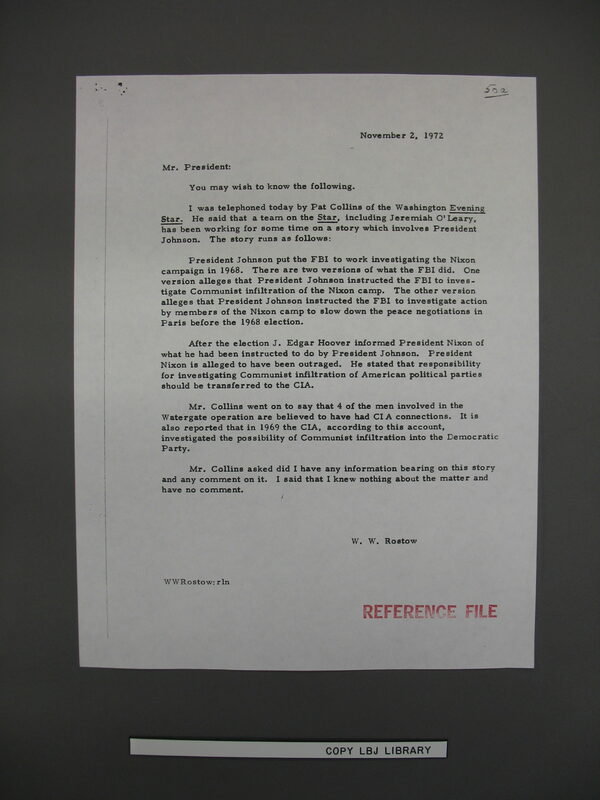 Thein also acknowledged possible pre-election contacts with elements of Nixon’s campaign. 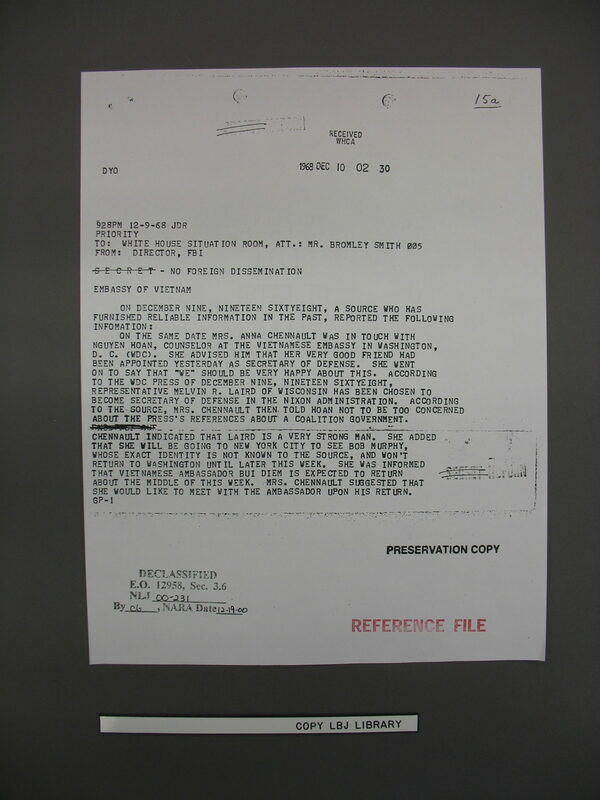 As the weeks passed and the peace talks remained stalled, Anna Chennault kept up her contacts with South Vietnam’s Embassy, briefing a senior diplomat there on Dec. 9, 1968, about Nixon’s selection of “her very good friend” Melvin Laird to be Secretary of Defense. But Johnson’s White House remained tight-lipped about its knowledge of Nixon’s treachery. 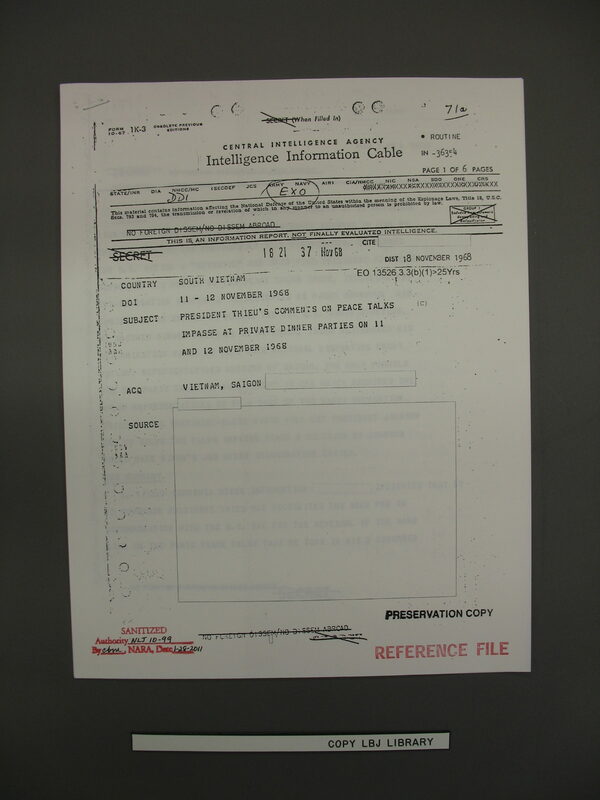 According to the documents in “The ‘X’ Envelope,” the first detailed press inquiry about the peace-talk sabotage came from St. Louis Post-Dispatch reporter Tom Ottenad who contacted Rostow on Jan. 3, 1969, just 17 days before Johnson would leave office. Even in retirement, Rostow remained mum about the Chennault episode, rebuffing another overture from Ottenad on Feb. 11, 1970. Ottenad also approached ex-President Johnson, but he too chose to hold his tongue, though his legacy had been devastated by his conduct of the Vietnam War and by his failure to end it. 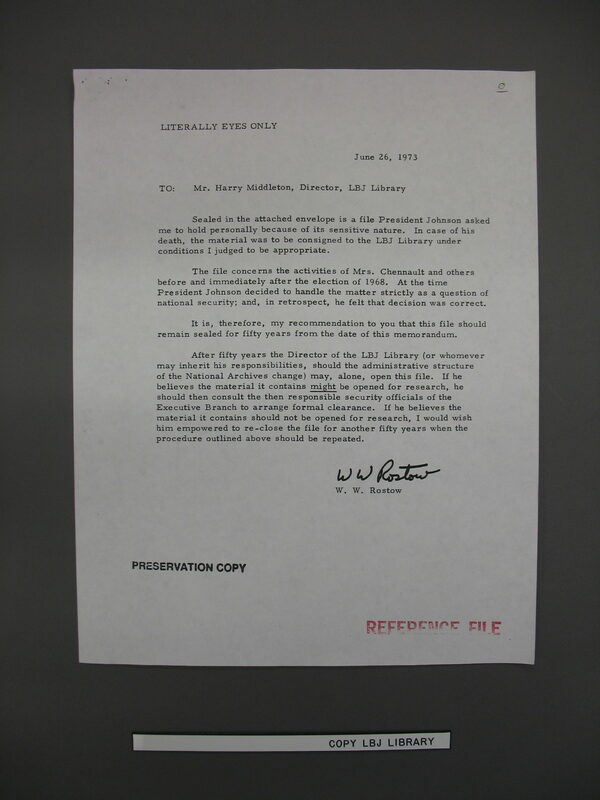 After Ottenad’s inquiry, Johnson’s aide Tom Johnson offered a heads-up to Nixon’s chief of staff “Bob” Haldeman about another possible story on this touchy topic. To a somewhat baffled Haldeman, Tom Johnson volunteered that ex-President Johnson had given no authorization to anyone to discuss the matter. From the start of Nixon’s presidency in 1969, the U.S. participation in the Vietnam War continued for more than four years at horrendous cost to both the United States and the people of Vietnam. Having allegedly made his secret commitment to the South Vietnamese regime, Nixon kept searching for violent new ways to get Thieu a better deal than Johnson would have offered. Seeking what he called “peace with honor,” Nixon invaded Cambodia and stepped up the bombing of North Vietnam. In those four years, the war bitterly divided the United States, as anti-war protests turned increasingly confrontational; parents turned against their children and children against their parents; “hard-hats” attacked “hippies”; Nixon baited one group of angry protesters with his “V” for victory sign and called other protesters “bums”; four students were gunned down at Kent State. But it seemed nothing could stop the war, not massive protests, not even disclosures about the deception that had gotten the United States into the conflict. Former Defense Department official Daniel Ellsberg leaked the “Pentagon Papers,” a secret history of the war’s early years, but the conflict still ground on. Fatefully, Nixon struck back at Ellsberg by organizing a White House “plumbers unit” that broke into the office of Ellsberg’s psychiatrist. The “plumbers,” including ex-CIA operatives, later switched their attention to Nixon’s political rivals, burglarizing the Democratic National Committee at the Watergate building in search of intelligence, including what dirt the Democrats might have on Nixon. Before U.S. participation in the war was finally brought to a close in 1973, on terms similar to what had been available to President Johnson in 1968, a million more Vietnamese were estimated to have died. Those four years also cost the lives of an additional 20,763 U.S. soldiers, with 111,230 wounded. Ironically, as the Democrats stayed mum, Nixon apparently judged that they were more concerned about the information regarding his Vietnam War “treason” coming out than he was. So, after some of his “plumbers” got arrested at the Watergate on June 17, 1972, Nixon began to view the 1968 events as a blackmail card to play against Johnson to get his help squelching the expanding probe. 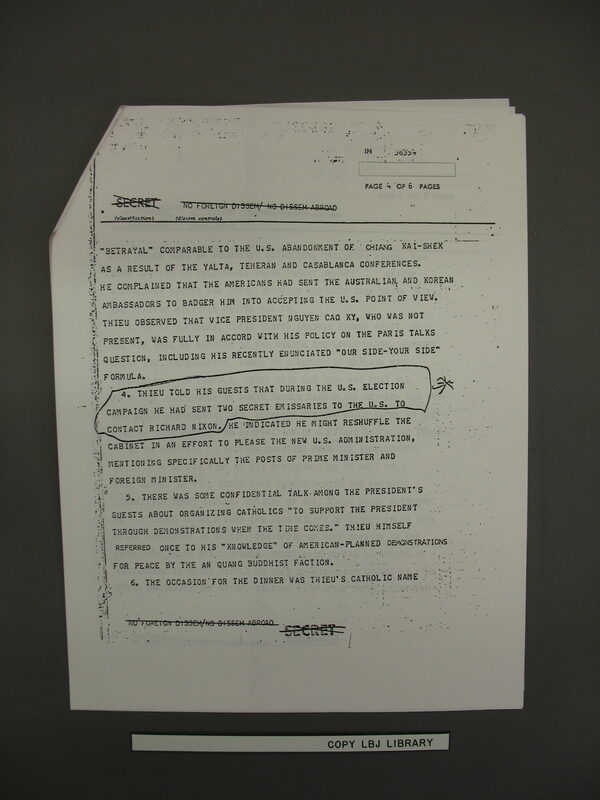 Nixon discussed the 1968 bugging in his Oval Office meetings about Watergate as early as July 1, 1972. According to Nixon’s White House tapes, his aide Charles Colson touched off Nixon’s musings by noting that a newspaper column claimed that the Democrats had bugged the telephones of Anna Chennault in 1968 when she was serving as Nixon’s intermediary to Thieu. 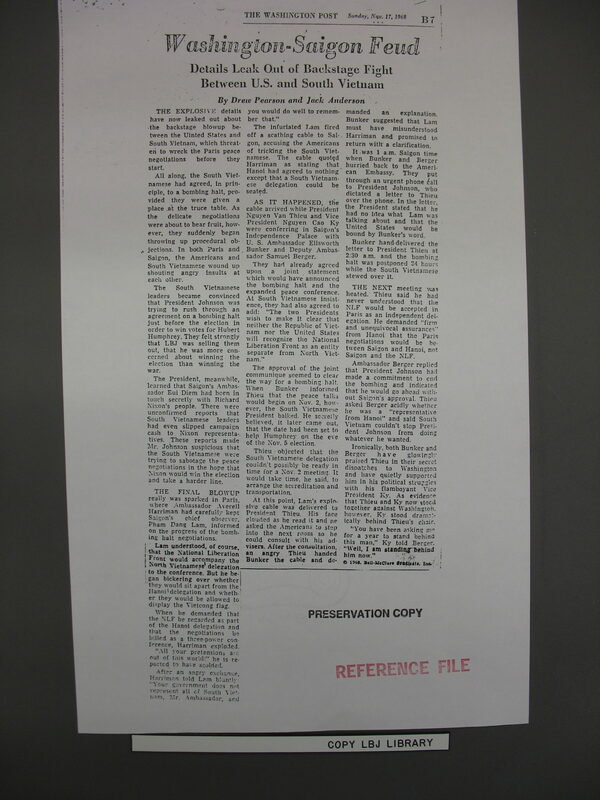 By early November 1972, as Nixon was cruising to an easy victory over McGovern but was worried about future problems with the Watergate scandal, the tale of Johnson’s supposed wiretaps of Nixon’s campaign was picked up by the Washington Star, Nixon’s favorite newspaper for planting stories damaging to his opponents. 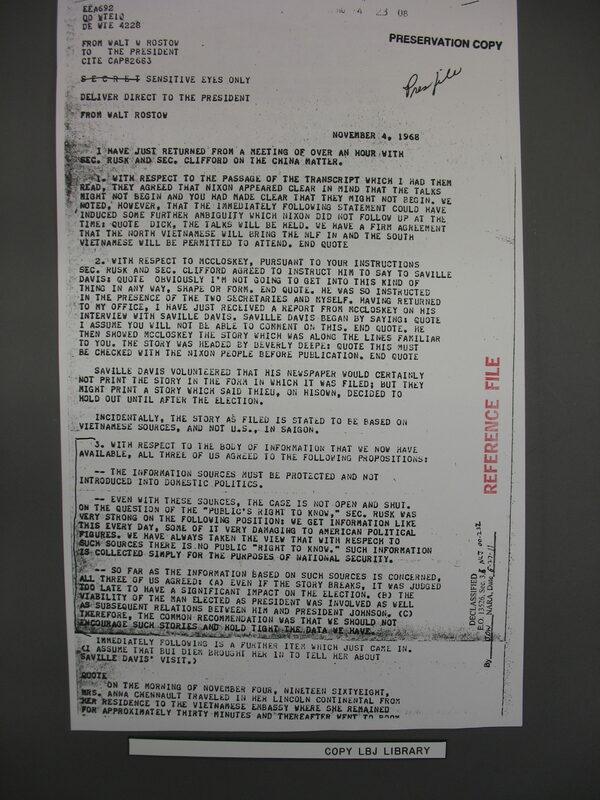 Washington Star reporters contacted Rostow on Nov. 2, 1972, and, according to a Rostow memo, asked whether “President Johnson instructed the FBI to investigate action by members of the Nixon camp to slow down the peace negotiations in Paris before the 1968 election. 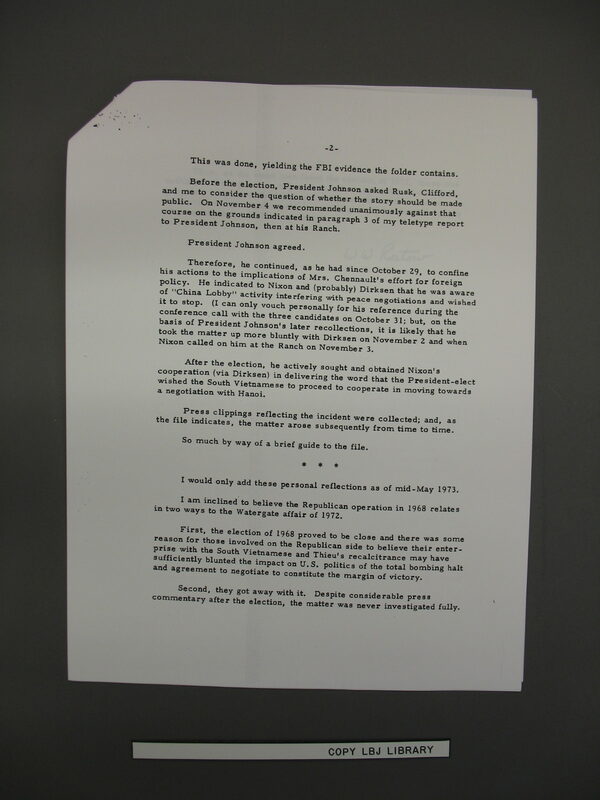 After the election [FBI Director] J. Edgar Hoover informed President Nixon of what he had been instructed to do by President Johnson. 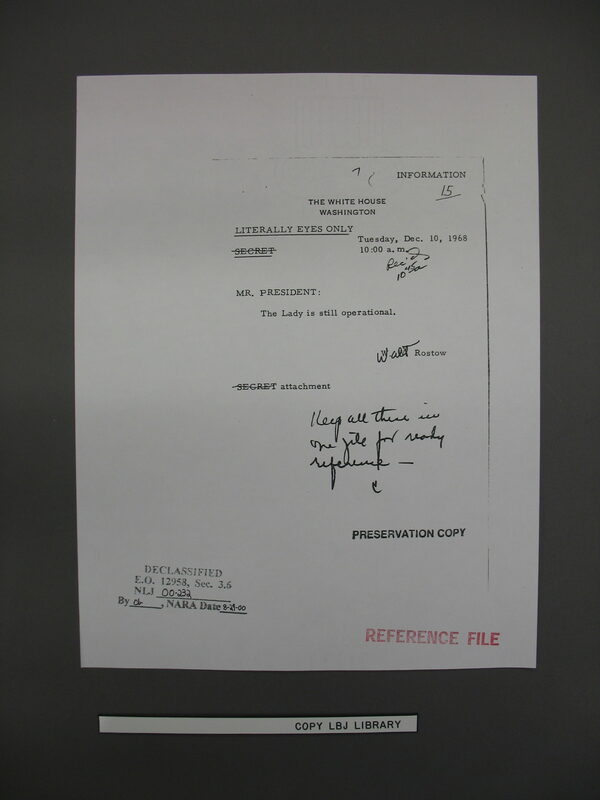 President Nixon is alleged to have been outraged.” But Rostow still was unwilling to help on the story. 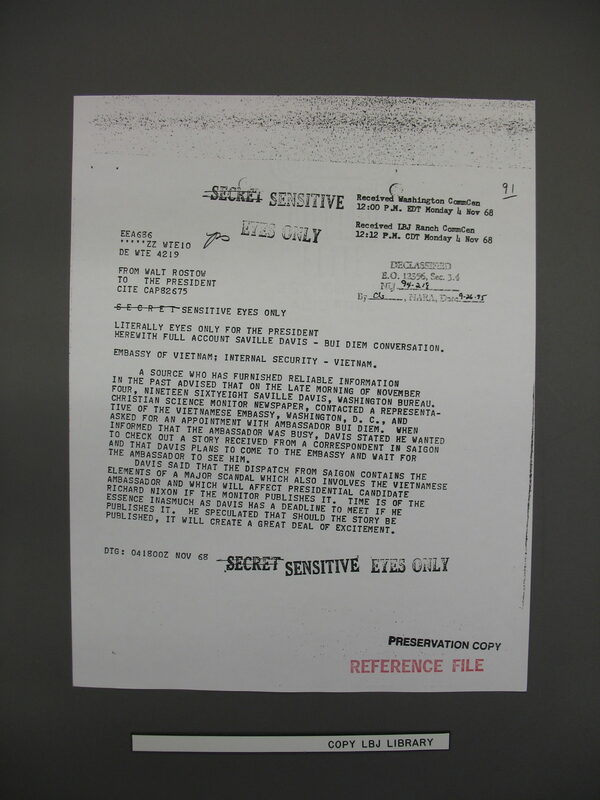 Hoover apparently had given Nixon a garbled version of what had happened, leading him to believe that the FBI bugging was more extensive than it was. 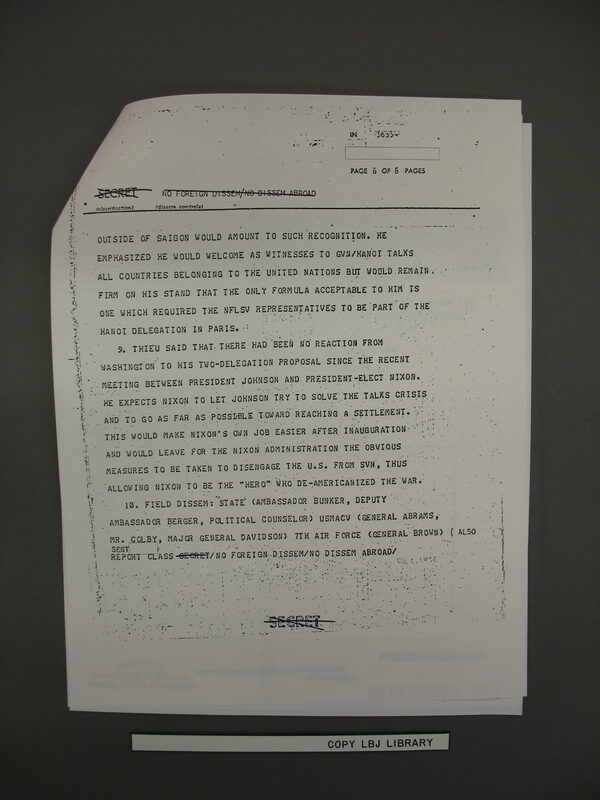 According to Nixon’s White House tapes, he pressed Haldeman on Jan. 8, 1973, to get the story about the 1968 bugging into the Washington Star. Haldeman, however, insisted on checking the facts. 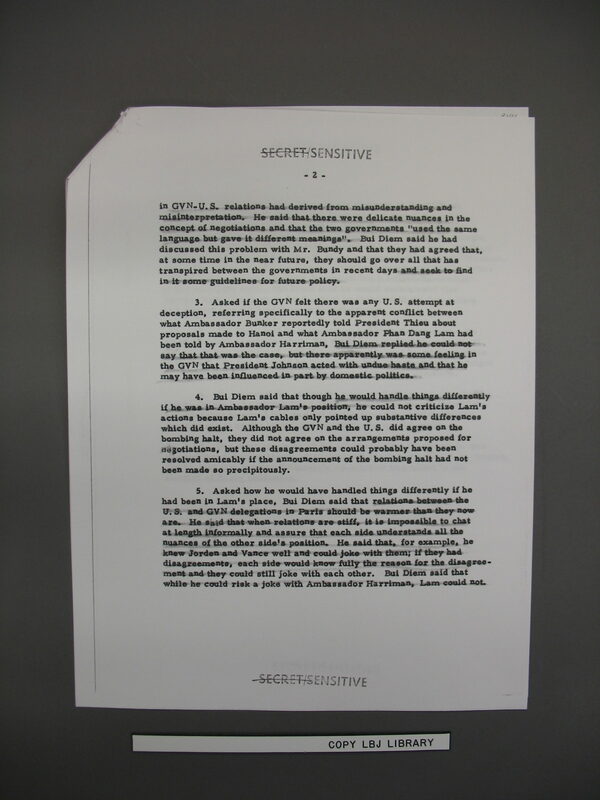 In The Haldeman Diaries, published in 1994, Haldeman included an entry dated Jan. 12, 1973, which contains his book’s only deletion for national security reasons. “I talked to [former Attorney General John] Mitchell on the phone,” Haldeman wrote, “and he said [FBI official Cartha] DeLoach had told him he was up to date on the thing. 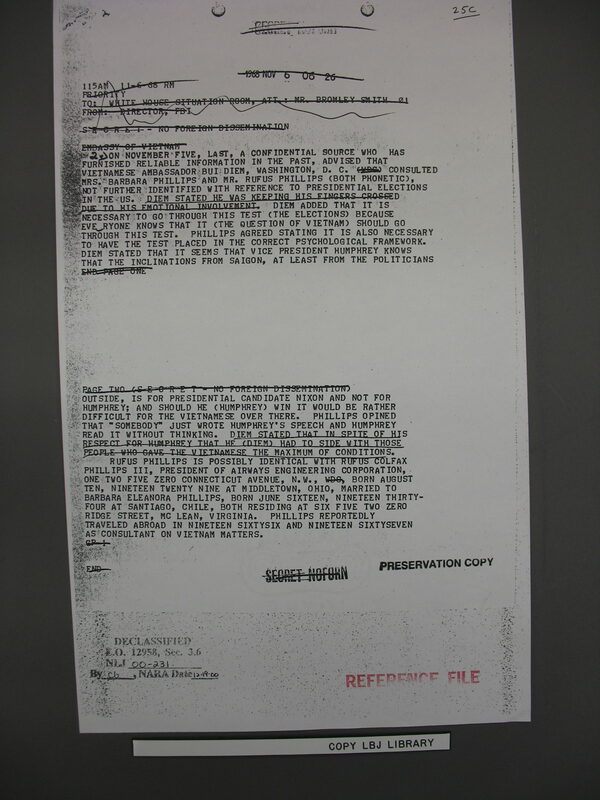 A Star reporter was making an inquiry in the last week or so, and LBJ got very hot and called Deke [DeLoach’s nickname], and said to him that if the Nixon people are going to play with this, that he would release [deleted material, national security], saying that our side was asking that certain things be done. 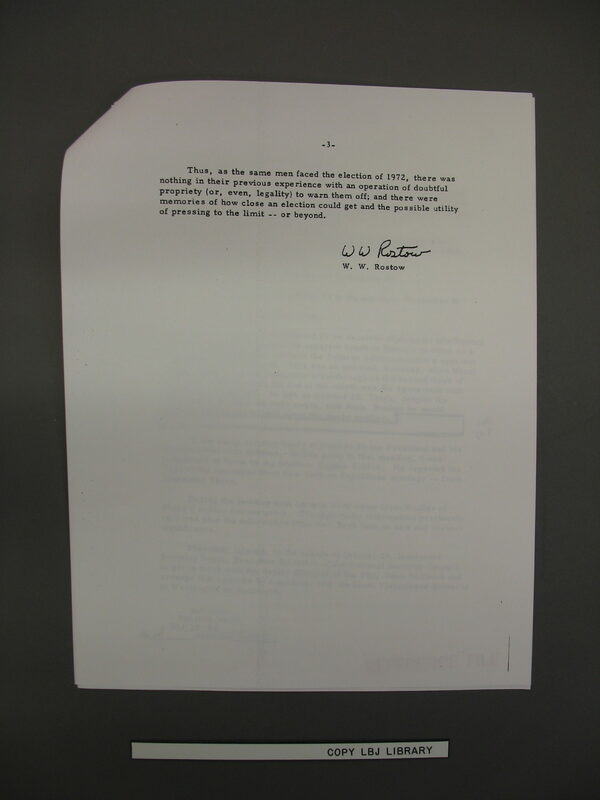 In other words, Nixon’s threat to raise the 1968 bugging was countered by Johnson, who threatened to finally reveal that Nixon’s campaign had sabotaged the Vietnam peace talks. The stakes were suddenly raised. However, events went in a different direction. On Jan. 22, 1973, ten days after Haldeman’s diary entry and two days after Nixon began his second term, Johnson died of a heart attack. 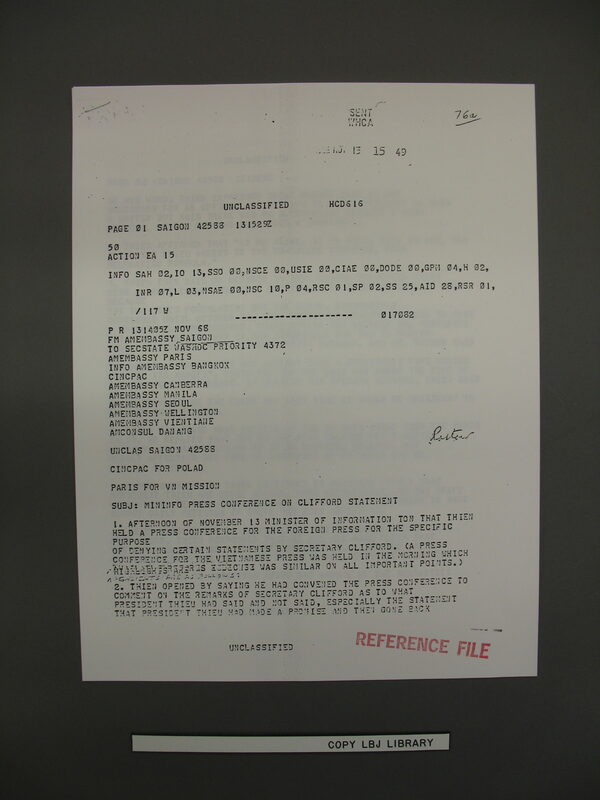 Haldeman also apparently thought better of publicizing Nixon’s 1968 bugging complaint. Several months later with Johnson dead and Nixon sinking deeper into the Watergate swamp Rostow, the keeper of “The ‘X’ envelope,” mused about whether history might have gone in a very different direction if he and other Johnson officials had spoken out in real time about what Johnson called Nixon’s “treason.” Still, Rostow chose to keep the facts from the American people. And the silence had consequences. Though Nixon was forced to resign over the Watergate scandal on Aug. 9, 1974, the failure of the U.S. government and the American press to explain the full scope of Nixon’s dirty politics left Americans divided over the disgraced president’s legacy and the seriousness of Watergate. Many Republicans viewed Watergate as a Democratic plot to reverse the landslide results of the 1972 election. 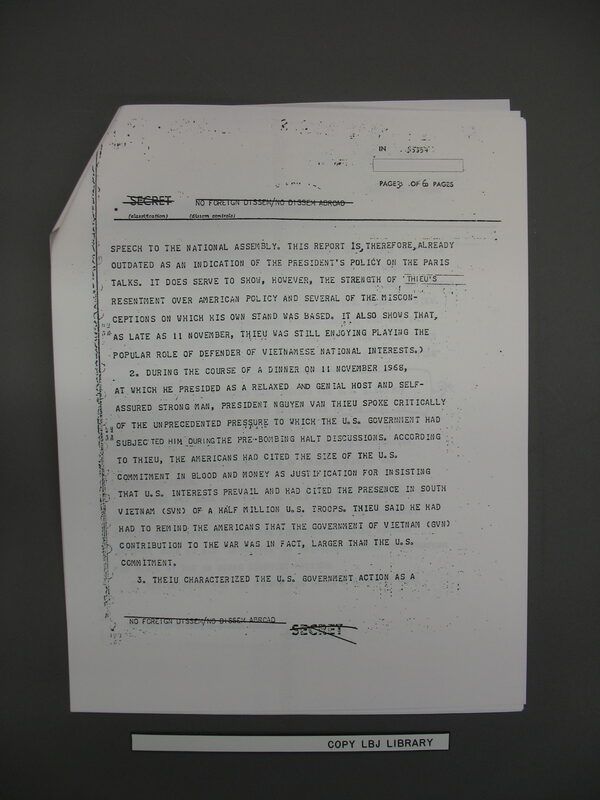 Other observers saw the scandal as an isolated event provoked by Nixon’s personal paranoia. But almost no one made the connection that Rostow did, that Nixon’s high-handed political espionage had involved an earlier scheme that dragged out the Vietnam War for four bloody years. If the public had known that story, including the evidence that some of Nixon’s Wall Street friends were using inside knowledge of the peace-talk sabotage to play the markets, the Republicans would have been hard-pressed to argue that Nixon was simply a victim of partisan Democratic scandal-mongering. In 1980, Anna Chennault published an autobiography entitled The Education of Anna, in which she acknowledged that she, indeed, had been a courier for messages between the Nixon campaign and the South Vietnamese government. She quoted Nixon aide John Mitchell as calling her a few days before the 1968 election and telling her: “I’m speaking on behalf of Mr. Nixon. It’s very important that our Vietnamese friends understand our Republican position and I hope you made that clear to them.” But still there was no outcry for a serious investigation. After all, if Nixon could get away with sabotaging Vietnam peace talks when half a million U.S. soldiers were in harm’s way, what was the big deal about upsetting President Jimmy Carter’s negotiations to free 52 U.S. embassy employees then held hostage in Iran? And if the Democrats eventually did get wind of any GOP-Iran hanky-panky, what were the chances that they would hold anyone accountable? Wouldn’t these Democrats be just as susceptible as Johnson’s team was to appeals that telling the whole sordid tale wouldn’t be good for the country? The Democrats had even taken a strange sort of pride in keeping these dirty Republican secrets secret. Democrats also presided over timid investigations of Reagan’s later arms-for-hostage deals with Iran, known as the Iran-Contra Affair, and of Reagan’s secret military support for Iraq’s Saddam Hussein in the 1980s, the so-called Iraq-gate scandal. In 1992, I interviewed R. Spencer Oliver, a longtime Democratic Party figure whose phone was one of those that had been bugged at Watergate. Oliver also was one of the few Washington Democrats with the toughness and tenacity to push serious investigations into these Republican scandals. While Oliver was surely right, there was also the tendency of Democrats to avoid the risks required to stand up to Republican abuses. The failed investigations of the 1980 October Surprise case, the Iran-Contra Affair and Iraq-gate seemed part and parcel with avoiding a confrontation with Nixon over the Vietnam peace talks in 1968. In all those cases, there was the echo of Rostow’s musings in 1973, wondering whether the silence of Johnson’s White House regarding Nixon’s “treason” in 1968 had proved not to be “good for the country” after all. By not holding the Republicans accountable, Rostow had reflected, “There was nothing in their previous experience with an operation of doubtful propriety (or, even, legality) to warn them off, and there were memories of how close an election could get and the possible utility of pressing to the limit and beyond.” But even with that recognition, Rostow still had kept silent. Indeed, if Rostow had had his way, “The ‘X’ envelope” today would still be locked away from the American people for another decade and possibly 50 years longer. By the time Rostow died on Feb. 13, 2003, the Republican Party had muscled its way back into power once more, via the tainted election in 2000 and the latest GOP president, George W. Bush, was marching the United States into another destructive war behind another smokescreen of lies and distortions, in Iraq. The ouster of Turkish Prime Minister Davutoglu marks another troubling milestone in President Erdogan’s consolidation of dictatorial power, a development that Alon Ben-Meir sees as further enflaming the region. The forced resignation of Turkey’s Prime Minister Ahmet Davutoglu suggests only one thing — President Recep Tayyip Erdogan, who is totally absorbed by his lust for power, will tolerate no one in his government to deviate from any of his political positions. Prime Minister Davutoglu was no exception. Although the Turkish constitution grants the Prime Minister executive powers while leaving the role of the president largely ceremonial, this is not what Erdogan had in mind when he asked then-Foreign Minister Davutoglu to form a new government following the last election. Erdogan’s ambition and aggressive drive to spread his Islamic agenda are what has determined every political move he made. Seeking to constitutionally transfer the executive authority of the country to the Presidency is the final step to legally consolidate his power, albeit he was already exercising such power throughout his tenure as Prime Minister for 11 years. Being that as Prime Minister, Davutoglu would assume leadership of the AK Party, Erdogan expected him to push for the transformation of the largely ceremonial Presidency into the most powerful executive position in Turkey, which Davutoglu pursued in a lukewarm manner as this would constitutionally diminish his own powers considerably. Not surprisingly, once Erdogan assumed the Presidency, he continued to chair cabinet meetings and even established a shadow cabinet with a handful of trusted advisers. He pointedly sidelined Davutoglu, who quietly resented Erdogan’s usurpation of the role and responsibility of the prime minister as if nothing had changed. The premiership became a ceremonial post and the ceremonial presidency became the all-powerful office without a formal constitutional amendment to legally grant him the absolute authority he is now exercising. I have known Davutoglu from the time he was the chief adviser to Erdogan and I found him to be a man of integrity and vision, always a moderating force, and committed to making Turkey a stabilizing regional power and a significant player on the international scene. I had many opportunities to talk to Davutoglu face-to-face about Israeli-Turkish relations, as I was actively involved behind the scenes to mitigate their conflict in the wake of the Mavi Marmara incident. On another occasion, I arranged for Israeli-Syrian peace negotiations to take place with Turkish mediation, not only because of its proximity and (at that time) good relations with both Syria and Israel, but also because I felt that Davutoglu would be the ideal interlocutor. Moreover, by playing such a role, Davutoglu was also very consistent with his commitment to realize his political philosophy of having “zero problems with neighbors,” which initially led to Turkey’s friendly and cooperative relations with most of its neighbors. Erdogan’s ambition to become the kingpin of the region through his brazen political approach, however, did nothing but create problems with every neighboring country. A former top Turkish official told me that had Davutoglu been given the flexibility to carry out his foreign policy vision, Turkey’s regional standing would be completely different today. During the past two years, however, several conflicts between the two began to surface. Whereas Davutoglu sought to renew the peace negotiations with the Kurdistan Workers’ Party (PKK) in the search for a solution, Erdogan not only refused but vowed to wage war until the last PKK rebel is killed. In addition, although Davutoglu said nothing publicly about Erdogan’s systematic attack on the free press, the jailing of journalists, and human rights violations, he disagreed with these unlawful measures and failed in his efforts to quietly persuade his boss to ease the pressure on the press. Erdogan’s insistence on silencing any criticism and the constant chipping away of what is left of Turkey’s democracy has basically sealed off (contrary to what is being said publicly) any prospect for Turkey to become an European Union member, which Davutoglu sought to realize with zeal. On top of all that, Erdogan is now seeking to strip Kurdish lawmakers of their political immunity to make it possible to charge them with being aligned with the PKK who are fighting for semi-autonomous rule, to which Davutoglu surreptitiously objected. It is now being left to the next prime minister to engineer this unlawful scheme to meet Erdogan’s draconian will. Finally, while Davutoglu was busy in his effort to achieve an agreement with the E.U. to take back illegal migrants in exchange for visa-free entry for Turkish nationals to the Schengen region, Erdogan publicly belittled Davutoglu’s efforts to deprive him of any political gains that he could derive from his success. To me and many other observers, Davutoglu’s words expressed the precise opposite of what he appeared to be saying: that Erdogan is beyond criticism. There was no better diplomatic way of putting it lest he be accused by Erdogan of treason, as customarily befalls anyone who opposes his political positions on any issue. Due to the turmoil throughout the Middle East, the influx of millions of Syrian refugees and the battle against ISIS, Turkey’s role has become increasingly important. Although the United States and the E.U. have grown weary of Erdogan’s absurd conduct, they feel compelled to deal with him, however distasteful that might be. Leave it, of course, to Erdogan to drain every ounce of blood from Western powers to serve his personal agenda. When the constitution is used as a tool for power grabbing, when conspiracy theories justify a cruel witch-hunt, when people are terrified to speak publicly about politics, when journalists are detained without trial, when the academic community is regularly attacked, when human rights are grossly violated, and when democratic principles are trampled upon, this is not a mere travesty for Turkey, it is a tragedy. With the departure of Davuto?lu, and a rubber-stamp AK Party, Turkey has become a de facto dictatorship, and there is now no one to stand in Erdogan’s way. It is a sad day for the Turkish people, as the country is now governed by a ruthless dictator with no checks and balances, no accountability, and with no prospect of any change for the better as long as Erdogan remains in power. The Turkish people should once again take to the streets but this time they should remain persistent until Erdogan relents or resigns. Otherwise, Turkey will continue to rapidly race toward an ever bleaker future where freedom will be a thing of the past and an authoritarian regime led by a ruthless leader sets in.